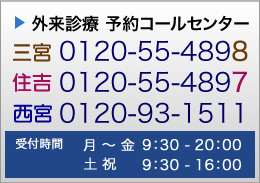 Please select a specialty below to meet our ANSHIN CLINIC Physicians. Just click the Condition name to get directed to an in depth look at our physicians credits. Osteoarthritis (OA), the most common source of knee or hip pain, is caused by excessive use or injury, and can limit mobility and daily activity. There are many approaches for relieving knee/hip pain, such as medication, injections, physiotherapy, arthroscopy, and replacement surgery. 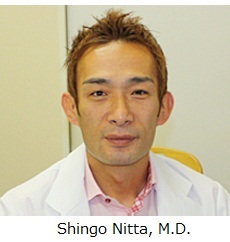 ANSHIN CLINIC is a state-of-the-art clinic for treating joint disorders. We have spacious and comfortable rehabilitation facilities and more than 30 experienced physiotherapists available for treatment. In the event that the pain is not relieved or reduced to a tolerable level, surgery is often the best option. 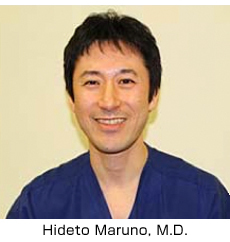 A feature of the ANSHIN CLINIC is our specialized Joint Replacement Team, which provides patients with a world-class joint replacement program. The team include orthopedic surgeons, physiotherapists, nurses, case managers, medical clerks, and other professionals. The goals of the Team are to improve the quality of patient care, increase patient satisfaction, improve outcomes, increase patient knowledge of events to come, reduce the length of hospital stays, and increase public awareness of the program. Extensive pre-operative education is designed to communicate to patients and their families precisely what to expect throughout surgery, recovery and rehabilitation. Knee/hip replacement is minimally invasive so it can be rightfully termed the quickest surgery possible. It has been medically proven that the less time the patient spends in OT, the lesser the tissue trauma and quicker healing. The majorities of patients in our clinic is on their feet the very next day and are encouraged to walk under the supervision of our well-trained and dedicated team of physiotherapists. On the fifth day, the patient starts stair climbing training. From evaluation and treatment through recovery and rehabilitation, our commitment is to meet your highest expectations. Our goal is to provide you with the most comfortable, efficient and effective delivery of care. Every step of the way, you will enjoy close personal care, coordinated by our specialists to return you to your active lifestyle as soon as possible. In recent years, increasing numbers of people of all ages have been heeding their health professionals’ advice to increase their activity levels for all of the health benefits exercise has to offer. But for some people—particularly those who overdo or who don’t properly train or warm up—these benefits can come at a price: sports injuries. Fortunately, most sports injuries can be treated effectively, and most people who suffer injuries can return to a satisfying level of physical activity after an injury. ANSHIN CLINIC offers expert clinical care for sports-related injuries of all types – from the best possible diagnostic services to state-of-the-art medical and surgical care to in-depth rehabilitative therapies. The best way to achieve a clear diagnosis is to carefully assess the history of the injury and follow with a clinical examination of the injured body part. This may be supplemented by special tests including X-rays, MRI and ultrasound. Our expertise comes from years of experience and a deep knowledge of the latest scientific developments in the field, our team is specially trained in the practice of sports medicine and provides a personalized approach catered to your specific needs. Whether you’re interested in preventing a sports injury or avoiding re-injury, the sports medicine experts at the ANSHIN CLINIC, we have put together some helpful physical therapists to get the most out of your sports and recreational pursuits while avoiding injuries. Our goal is to help you return to the sports you love, and enjoy a healthy, active life for as long as possible. The knee is the largest joint in the body, and one of the most easily injured. Normally, all parts of the knee work together in harmony. But sports injuries, work injuries, arthritis, or weakening of the tissues with age can cause wear and inflammation, resulting in pain and diminished knee function. 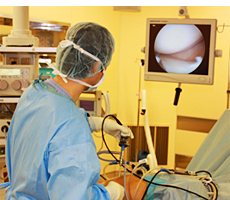 If surgery is necessary, most knee problems can be resolved through arthroscopy. Signs that you may be a candidate for this procedure include swelling, persistent pain, catching, giving-way, and loss of confidence in your knee. When other treatments such as the regular use of medications, injections, knee supports, and physical therapy have provided minimal or no improvement, you may benefit from arthroscopy. Following your surgery we will guide you through post-operative rehabilitation so you can quickly return to your normal daily activities. 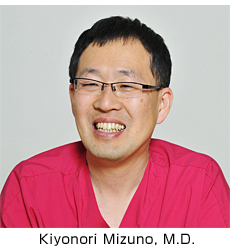 At ANSHIN CLINIC, we specialize in the assessment, diagnosis and rehabilitation of all shoulder and elbow problems. We look at the entire individual and the demands placed on his or her shoulder or elbow, offer a full range of surgical and non surgical treatments, and work closely with specially trained physiotherapists to achieve the best result possible for you. When a patient comes in with shoulder pain, as with all of the conditions once the symptoms have been described the shoulder will be examined to try to localize the pain. Plain x-rays of the shoulder will be taken. Further special tests (e.g. MRI) will be organized as necessary, and then we provide you initiate conservative care such as medications such as anti-inflammatory, steroid injection, and physical therapy. Shoulder disorders can result in considerable pain and disability. Physiotherapy is often the first line of treatment for shoulder disorder. Our physiotherapists are experienced clinicians with extensive experience in the assessment and management of shoulder disorders and allow us to offer the appropriate care that you are seeking. Program of shoulder pain therapy is the best treatment to get rid of pain and stiffness in a fraction of the time normally required for the disorder at the root of the pain to resolve naturally. Our mission for all age groups is to return you to your pre-injury level, and especially for athletes, to safely and quickly return you to the top of your competitive sport. Almost all of our patients fully recover with those non-surgical treatments. 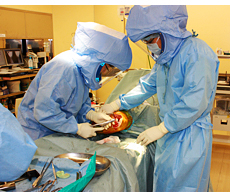 Our team prides itself on focusing on non-operative solutions to your orthopedic problems. Arthroscopy is recommended when such treatments have provided minimal or no improvement of your symptoms. The benefits of arthroscopy involve smaller incisions, faster healing, a more rapid recovery, and less scarring. The surgeon can determine the amount or type of injury, and then repair or correct the problem, if it is necessary. The most important thing after the surgery is that you understand the healing process and participate in your post-operative recovery, because the results of the surgery are most effective when a post-operative rehabilitation program involving physical therapy and shoulder exercises are implemented daily. 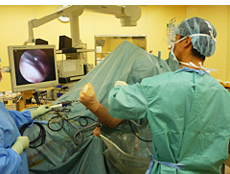 Arthroscopic shoulder surgery is partnership between the doctor and patient. So you need to follow-up visits to your surgeon for 1 year from the surgery. What’s causing my back pain? It’s a common question, and a visit to your doctor is an important first step in getting an answer. The diagnosis of back pain isn’t always easy. The human spine is very complex, so it can be difficult for a doctor to pinpoint the exact cause of low back pain, radiating leg pain or other symptoms. In addition, other factors like depression, anxiety, or stress can contribute to the onset of back pain. 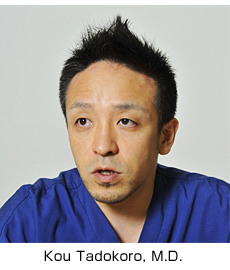 At the ANSHIN CLINIC, we provide the highest quality and effective care for all spine problems. Each patient is carefully evaluated by spine specialists, who develop an appropriate plan to treat the individual’s specific needs. The team includes orthopedic physicians and surgeons, physical therapists, and we have a cooperative relationship between pain management specialists as well. Our physicians have many tools to help determine the cause of pain. These include a thorough evaluation, x-ray, MRI, and CT scan. Once completed, the treatment plan might involve medications, injection therapies, physical therapy, and surgery when necessary. 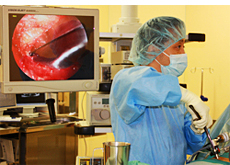 More than 90% of our patients are successfully treated without surgery. However, when the pain and symptoms are unresponsive to nonoperative treatment, or the neurologic problems develop, such as weakness, numbness, or bladder dysfunction, or the pain and symptoms significantly affect quality of life, surgery is needed. 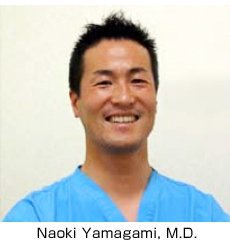 At ANSHIN CLINIC, we provide minimally invasive surgical techniques for all spinal surgeries. Minimally Invasive Surgery (MIS) offer several advantages, including minimal scars, minimal muscle-related injury, a shorter hospital stay, reduced postoperative pain, a shorter recovery to work and daily activities, compared with the same surgical objectives as open surgeries. Surgical goals include decompress the spinal cord and/or spinal nerves (relieve pressure) and stabilize the spine, if necessary. We use MIS for disc herniation, spinal stenosis, degenerative disc disease, spinal instability and spinal mal-alignment. Lumbar Decompression Back Surgery is involves removing a small portion of the bone over the nerve root and/or disc material from under the nerve root to relieve pinching of the nerve and provide more room for the nerve to heal. MIS spinal Fusion instrument is used to restore stability to the spine and to correct spinal mal-alignment.